The Website Builders don't require you to be a computer genius nor a coder to get to grips with building your website. The simple drag + drop and editing functionality along with tutorial videos and YouTube videos, you'll be able to create your website with ease. Using the Free Zyro Web Builder is a quick and easy way to set up a website using a template. Creating a website is pretty easy and you don't have to be a technical wizard to use it. 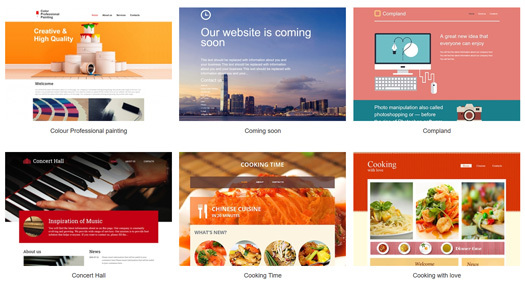 Just choose the template you like the look of or search by category and customise away. You can even just use the base theme and build your own layout. If you have no previous experience you can still create a stunning responsive website in no time at all by using this free website builder. 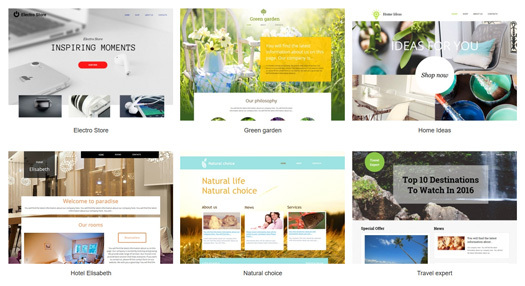 This Web Builder tries to offer a broad spectrum of themes to suit all personal or business needs but if you don't find one to suit then you can just choose a layout you like and change it to match your website requirements. 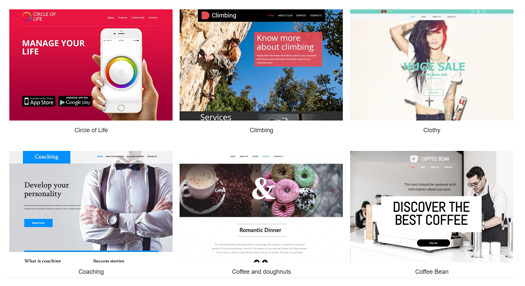 So whether you're a outdoors type, a small business owner or a photographer, you can use this customisable Website Builder and the included templates to create your own website which will work in all devices. 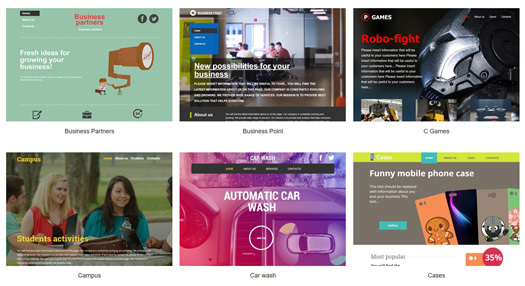 Install, choose a theme, customise and publish. It really is as easy as it seems. 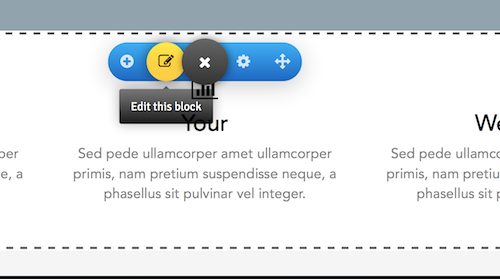 Click a module to add and drop it into the pane then drag and place it where you want it. It's such a simple way to do things there's no reason not to give it a try. It is easy to create and place any sort of data: text, images, forms, Google Maps, You Tube videos, galleries or tables. Photographs and items stored locally on your drive can be dropped anywhere and then placed where required. Add any social media modules into your pages and build your following. Use the available icons and drop them onto the page and place them wherever you need them. This Website Builder is included in all cPanel hosting packages and is included absolutely free of charge! On either side of this tab you'll see clickable tabs for each of the web builders. Have a read through each to see what they do. You'll see some videos below that provide a brief overview of what each Web builder does. Whilst the results are the same, a complete fully responsive website, the methods and the style by which these builders achieve the results are different and you may prefer one over the other. If at any time you need any advice or help feel free to get in touch with our friendly support team who will try to answer any questions you may have. When editing an area, just move your mouse over the relevant content block that you want to edit and the default toolbar will appear with your respective editing features for that content area. No previous HTML knowledge is required to use this website builder, however, each element or block can be opened in an easy to use visual HTML editor if it is required. The same as the Zyro Website Builder, click a module to add and drop it into the pane then drag and place it where you want it. It's pretty simple really, each template available in the Stack Website Builder has thousands of customisable permutations with 6 core layouts, 6 core menus, 60 core colours and over 150 custom fonts. Add Professionally designed fonts, over 150 hand picked fonts to make your website look extra special. You can choose two different fonts, one for website content and one for headers & menus. Make a stunning responsive website with organised content blocks for paragraphs, headers, feature boxes, downloadable files, images and videos. Add Contact Forms, Maps, Photo Galleries, Slideshows, Use Form Builders, Shopping Carts, Newslettersand more. This Website Builder is included in Stack Tier 3 Web Hosting Packages and is included absolutely free of charge! If you want Stack Builder in a different package than Stack Tier 3 then please let us know and we'll try to provision this for you.